Closed for the season! Opening Day of the Suffoletta Family Aquatic Center is May 26, 2018! After August 8th, the Suffoletta Family Aquatic Center will be open weekends only through Labor Day. 2018 Suffoletta Aquatic Center Season passes are available now at the Pavilion. Season. Season Passes will also be available at the Suffoletta Family Aquatic Center beginning May 26th. The following entry fees and pass fees are listed with Resident price first and Non-resident price second. All fees are subject to change. Anyone violating or attempting to violate the above mentioned category definitions must forfeit their pass immediately for one year from the date of forfeiture. Only the person named on the pass/card may use the pass/card to enter the Pavilion or Aquatic Center. Further, anyone allowing another person to utilize their pass/card must forfeit their pass immediately for one year. No monies will be refunded for violation of these rules. Family and couple passes may require proof of residence for all household members (i.e. tax returns, picture ID, etc.). The Suffoletta Family Aquatic Center is available for rental. The deposit cost will equal 50% of the cost of the rental and is NOT applied to the actual rental fee. The rental fee must be paid 2 weeks prior to the date of the rental. If the renter does not pay the rental fee by this time, the deposit will NOT be returned and the room or area will then become available for rental.The deposit fee is due at the time of the reservation. The rental fee must be paid in full two weeks prior to the event. Each fee reflects a two hour rental. The deposit fee will be mailed to the renter in the form of a check within 10 business days after the event. The areas used must be left clean and orderly by the renter in order to receive the deposit return check. Party Package includes entry and use of Funbrella Area for 2 hours. Certified lifeguards will be on duty at all times. Patrons, who do not obey pool rules, will be disciplined based on the severity of the action. An adult (16 years and older) must accompany children under the age of 10 at all times. The child must be within sight of the adult at all times. Children 5 years and younger must be within arms reach of a responsible adult at all times. A maximum of 2 children five and under per adult. All persons entering the facility must have a pool pass or pay an entry fee. Persons leaving the facility will be required to pay an additional entry fee upon reentering. Children under 3 years of age must wear plastic pants or swim diapers per The Center for Disease Control recommendations. No outside food or drinks are allowed in the facility. Food or drink permitted in authorized areas only. Do not leave belongings at concession tables. Concession tables are for eating and drinking. Food and drink products (except water) are not allowed on the pool deck. Food and drink allowed on patio grassy beach only. No Diving allowed anywhere in the Suffoletta Family Aquatic Center. Proper swim attire must be worn. No cutoffs, shorts, or leotards permitted. Only white T-shirts will be allowed. Tobacco products are allowed in designated areas only. Alcohol is not allowed. Any person suspected of being under the influence of alcohol and / or controlled substance will be asked to leave the facility. Persons with contagious conditions, open wounds, sores, infections, or fungal diseases are not allowed in the pool or pool area. Running, pushing, shoving, boisterous and rough play are prohibited. Spitting, spouting water, or blowing nose into water is prohibited. The lifeguard must approve any flotation device. Children unable to swim may use a USCG approved life jacket. Floats and noodles are not permitted. Street clothes or street shoes are only permitted in designated areas of the pool deck. There will be a 15 minute safety break every hour for participants under the age of 18 years. There is a maximum of 2 children per one adult during break. Adults with children 5 years and under may swim during break in the Leisure pool. Only service animals are welcome at the facility. Management reserves the right to take action on any situation that may not be in the best interest and safety of the public. 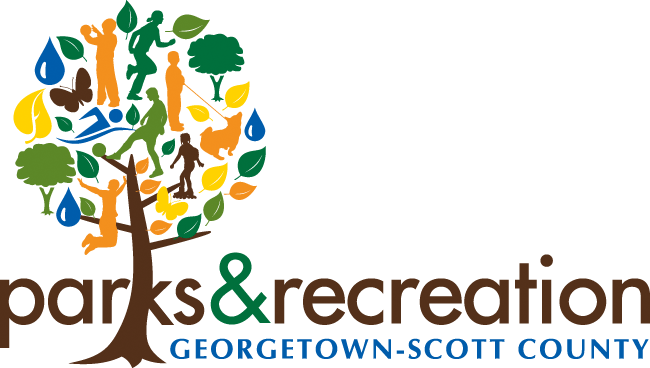 The Georgetown – Scott County Parks and Recreation Department is not responsible for lost or stolen articles. The use of tubes, life jackets, flotation devices, goggles, masks, sunglasses, fins, suits with zippers, or anything plastic or metal on a suit that scratches the slide or other features is not permitted on the slide. Lifeguards will not catch sliders. Only one person is allowed on the slide at a time. The attendant will signal when the next slider may go. Patrons must be 48″ tall or taller to use the slide. Patrons, who are pregnant, have a fear of heights or have experienced heart or back problems, should not ride the slide. Sliders must go down the slide on their back, feet first, ankles crossed and hands crossed over chest. There will be a 15-minute safety break every hour for participants under age 18 years. Do not use the railing to push off. Ask the attendant for assistance. Wait at top of stairs until preceding person swims to the ladder. The attendant will indicate when it is safe to begin. Keep moving on the slide. Cutting the line, place holding, and spitting off the tower is not permitted and may result in dismissal from the facility. Exit immediately by the ladder or cross under the rope. Failure to follow slide rules can result in serious injury to yourself and others. It will result in the loss of your privilege to use the slide. Cool off during hot days at the Suffoletta Family Aquatic Center’s spray features. You don’t need swimming skills to enjoy the spray feature. From the tiniest toddler to a pre-teen adventurer, and even those using wheelchairs, children of all ages and abilities enter with equal enthusiasm. The Spray Ground Feature is for children up to 10 years of age. The Central Play feature is available for all ages. Children in the spray ground area MUST be under the direct supervision of an adult 16 years and older at all times. Climbing on, diving off, or jumping from play equipment is prohibited. Food and drinks are permitted in grassy eating areas only. Riders must wait for instruction from lifeguard before starting. Riders must use tubes provided. Two sizes are available. Adults (16 years and up) with children 5 years and younger must ride in tubes together. Limit one child per adult. Otherwise only one rider per single rider tube. Children 5 years and younger must be within arms reach of a responsible adult at all times. Children less than 48” tall must ride in an adults lap. Children under 3 years of age must wear plastic pants or swim diapers due to The Center for Disease Control recommendations. The Double tubes have a two person limit. One time around then exit immediately when people are waiting. For further information please consult the full set of pool rules in the building. Rules may be adapted or changed as needed and/or without notice.